Can’t believe it’s Thanksgiving week already! I hope you and your families have a wonderful Holiday! This past weekend I finished up some more Christmas projects (and slowly started to put things out LOL). This time I made some Christmas wreathes for the great room doors (on the inside). 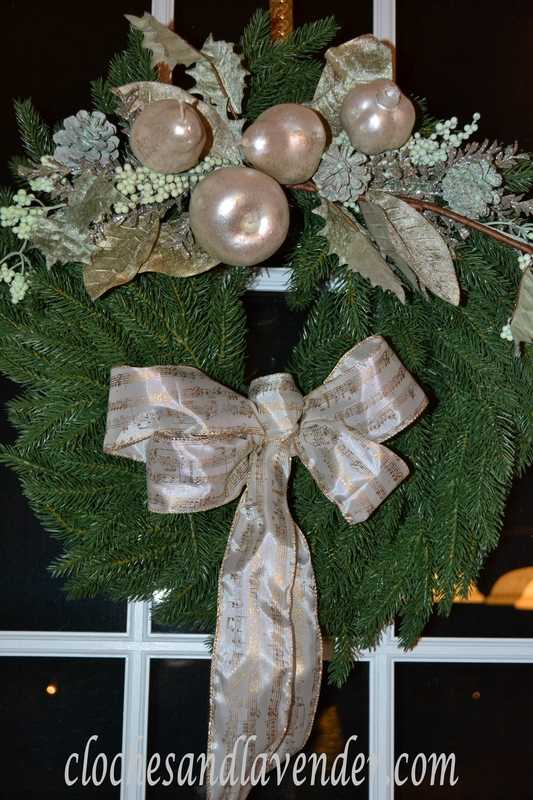 I purchased these two wreaths from Balsam Hill. They were originally $100 a piece and I got them during an early season sale for only $24!! They are very realistic looking and soft. I like them very much. I purchased the swags on top of the wreaths from Michael’s and I hand tied the bows from ribbon I purchased there too. I just love this ribbon and I can’t believe how inexpensive wired edge ribbon is at Michael’s. Both came out nicely and have started to give the room that Holiday feel. They came out very pretty. I especially like the colors you chose. Very pretty! I love the soft colors! Thanks and have a great Thanksgiving if I don’t speak to you before then. Lovely, Cynthia. 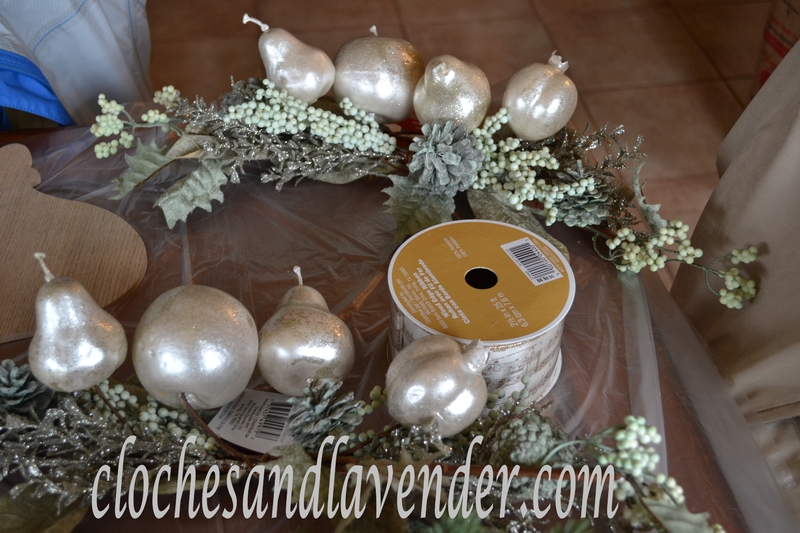 Like the subtle creams and golds in these wreaths. Cynthia, this is lovely! You did a wonderful job decorating this wreath; the colors are so pretty! Happy Thanksgiving! Thank you so much. The whole project was fun and making your own bows is great. That is a lovely Wreath! I am just stopping by to let you know that I am featuring your repurposed cabinet doors from last week’s post at my HOME party tomorrow. Happy Thanksgiving to you and your family! Thanks so much and thank you for the feature. Great wreath design. Have a Happy Thanksgiving. 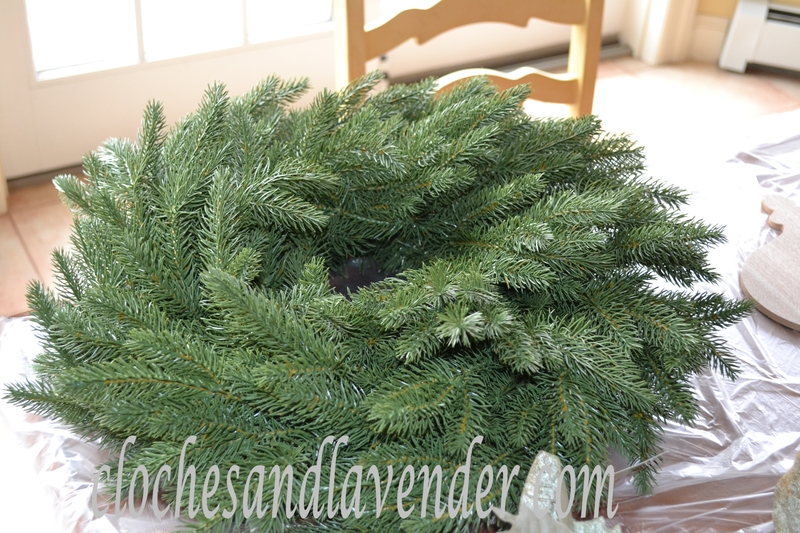 Balsam Hill, I’ve never heard of them, but they make a super natural looking wreath! Very pretty! Thanks Barbara, I found them on the internet. Happy Thanksgiving. Wow – I never would have suspected that those wreaths weren’t live – they look great! Happy Thanksgiving!! I know they are great. Thanks so much and Happy Thanksgiving, Stacy. Beautiful wreath! !…I just love the colors…I am trying to incorporate more of those colors in my decor this year!!…. I love them and they are so realistic looking. It’s hard to believe that wreath is not the real deal, it is so realistic looking! And what a beautiful job you made of it too! I love the swag on top and the ribbon is pretty too. Thanks so much for sharing this at my HOME and Happy Thanksgiving to you and your loved ones! Thank you so much, they are very realistic looking. I love them. I got such a great deal. Happy Thankgiving. These are the best faux greens I’ve ever seen and you did get them for a super price. The finished project is very festive. Thank you so much for your kindness. They were a steal I saw that price and bought them right away. Your wreaths are lovely. You sure got a good deal on them! It is amazing how cheap the ribbon is at Michaels. Well done! Happy HOME! Thank you so very much, I got a fantastic price I couldn’t believe it that is why I jumped on it right away. Oh my…I thought it was a REAL wreath Cynthia! What a beautiful job you did…and a good deal on the wreath 🙂 Wishing you and your family a lovely Thanksgiving as well!! Thanks you so much. Happy and Healthy Thanksgiving. Cynthia, You are so creative! The wreaths are beautiful! Happy Thanksgiving to you and your family! How pretty! 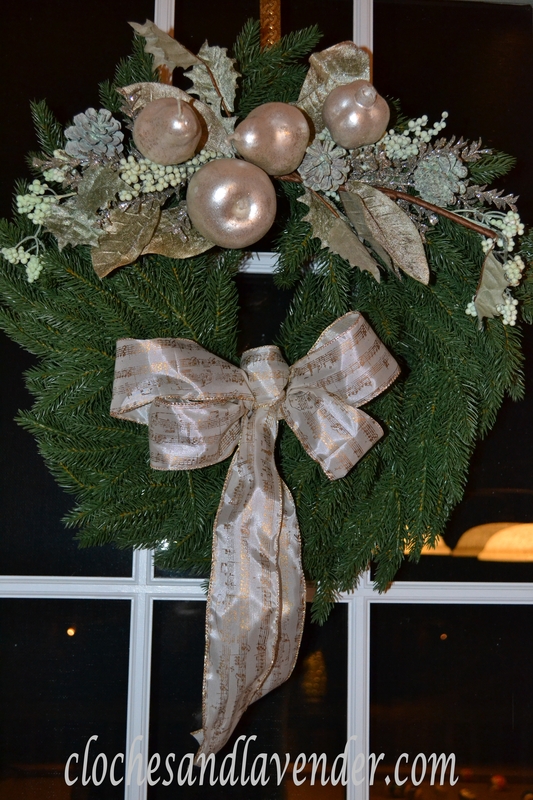 Looks like an expensive Holiday wreath to me:) I love it. Thanks for sharing with the party. $100 marked down to $24 was a steal anf they look so real. I bought them both. Thanks for hosting. Wow! What a bargain!! How could anyone pass up that price! And they look so real, too. Great find! Wow, what a great deal you got, Cynthia! They look so pretty! I’m in the midst of my Christmas decorating. I hoped to get it done this weekend, but my son is visiting. Oh well, if not the weekend, certainly by mid-week I should be done. I know they are great wreathes and I wish I bought more. I just looked and that deal is gone big time. Oh well. I am trying to get my house decorated too. Thank you and I hope you will follow Cloches and Lavender. Cynthia – it’s beautiful! I love how you did all white…perfect! Just lovely! Gotta love those greens! Thanks for linking up this week! Your wreaths are gorgeous Cynthia! They have such a vintage feel to them. I hope you and your family had a wonderful Thanksgiving. Thank you so much Donna, I am happy with the way they turned out. We had a great Thanksgiving, lots of fun and food!